See more on this topic from the U.S. side on International Weather Page updated on 30th. November. As is known, Vagaries has always been a resolute dis-believer in the so called GW theory. Yes, there's nothing like GW, and its always been the ups and downs of the natural weather patterns. (Have written several blogs on this, against this, to prove the point. Could be refered to in the Vagaries archives of December 2009). Now, this year, we have cold waves from many parts of the Northern hemisphere. I'll just put up the headlines of these, instead of a detailed write up. 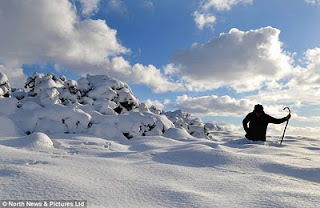 GREAT BRITAIN UNDER WINTER'S SIEGE AS SNOW AND COLD ALL BUT CRIPPLES MOST AREAS, TEMPS DROP TO -18C AND 1-2 FEET OF SNOW FALLS!!! Several UK locations have reported their coldest November temps on record. NORTHERN IRELAND: Lough Fea, Co Tyrone reported -9.5 (15F).....Read more in detai on U.K. severe cold on Mark's Blog here. 25 Nov 10 - According to new GRACE satellite results, world average sea level rise is about 1 millimeter per year, or about 0.04 of an inch. "The low end of IPCC forecasts is about double that at 1.9 mm/year," says Steven Goddard. "Hansen has been talking about 30+ mm/year. Once again the experts demonstrate that they have no clue what they are talking about." Consisting of a pair of satellites moving in an orbit that takes them over the South and North Poles, GRACE stands for Gravity Recovery and Climate Experiment. One millimeter is about the thickness of a dime. Take 100 dimes, stack them on top of each other, and that's how much sea level should rise in the next 100 years. Four inches. Four INCHES! And, If the results hold up to scrutiny, then that’s a big chink in AGW alarmism. Ocean temperatures are plummeting and are below normal. See any red? or even Oranges ?? And, remember, oceans consist 0f 75% of the Earth's surface. Looked at ocean heat content figures lately ? They’ve flat-lined since 2003! A check of recent satellite sea-level figures is revealing too! Levels are now only a fraction above minimums in 2003 and given current cooling trends may even drop below them shortly! Don't go by the media reports, my friends, they are only doing their job, hype up things, hype them totally out of proportions !! well said !! this makes me recall how a lobby hyped that coconut oil was bad for heart so that the product was available at cheaper rates in soap making industry. Pamolein industry also benefited. Now the wheel has come one full circle. So wait for that to happen on weather front also in a few years. very true emkay. and thanks . Rajesh, my two cents on this Global Warming debate. I think the issue around Global Warming is not to do with the fact that weather is necessarily going to be consistently warmer. The effects would be (as I believe and understand) felt in the way of erratic behaviour of weather (behavior as compared to the normal expected). 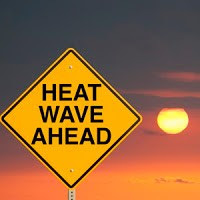 Which means if the winter in a particular place is much nastier than usual it would still mean the weather is going erratic or let's say a place which experiences very hot summers suddenly experiences a cooler one it is still not 'usual'. Hence a cooler then normal winter is not an argument against Global Warming, on the contrary one can argue it is for it. Secondly, the summer this time has been pretty severe in Russia and I was reading about the unusual warmth in Chicago for this time of the year. I am not hinting that these are obvious pointers towards Global Warming but these are again 'unusual' situations. Having said the above, I personally am not a big fan of the alarmists on Global Warming, but if you look at it, this is one area that can yield good results even if it is totally hyped up. Imagine this hype driving cleaner fuels, less polluted rivers etc. the resultant is all good. Good points raised. Your first point.nasty and extreme weather is nothing new on this planet. We have heard of much severe weather earliar too, when the GW hype was not created.As in this year, severest weather in U.K. in 17 years,yes nasty and extreme. But why link to GW ? Hasn't it happened 17 years ago, and this year it has happened again ? Unusual, means that which is not usual. That means does not occur usually. But , has happened before, sometime ago. Please go thru Vagaries archives of dec 2009, and the heat wave of Chicago of 1924 is mentioned . Was there GW then in 1924 ?? ok, not polluting the air, and not felling trees must be adhered to, but not by alarmist methods like GW ! When it turns out to be false, what will be the outcome? November rains in Mumbai are not the highest ever ! Like I said Mumbai had 164 mm in nov 1946, and the heaviest fallin a day in nov was 123 mms in 1927 ! GW then too ? ?